A Milton man is facing charges for allegedly letting his dog repeatedly attack a cat until it died. Lonnie Rachal, 61, was charged with causing cruel death, pain and suffering to an animal, a third-degree felony, for the alleged incident on Oct 27, 2017. 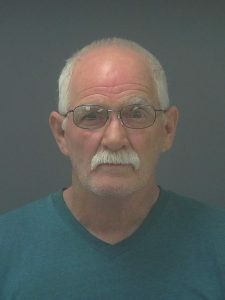 The Santa Rosa County Sheriff’s Office arrest report claims Rachal repeatedly allowed his dog to attack a cat in the backyard of his Bass Lane home. Rachal would hit the dog in an attempt to get the animal to release the cat, but every time the dog would let go, Rachal would pull the dog a short distance away and release it to go after the cat again, according to the report. The same thing happened two or three times before the cat was killed. Rachal allegedly buried the deceased cat in the woods near a vacant home across the street. SRSO submitted a warrant for Rachal’s arrest and he was taken into custody Saturday. Records show he was released from Santa Rosa County Jail the next day on a $5,000 bond.